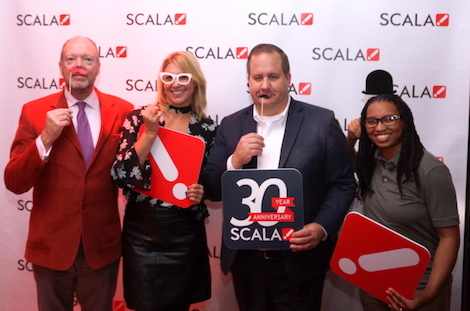 There was ONLY way to celebrate Scala’s 30 year anniversary and that was with a super-exclusive party, held last week, slap-bang in the middle of New York Digital Signage Week! 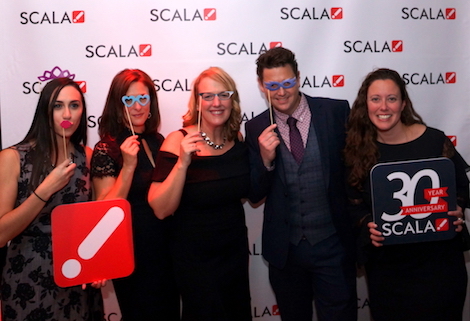 As you will see from the photo above, DailyDOOH’s editor-in-chief even wore a Scala-red jacket for the occasion (shown from left to right, with DSE Show Director Andrea Varrone, STRATACACHE and Scala supremo Chris Riegel and TheSmoothFactor’s Alesia Hendley. 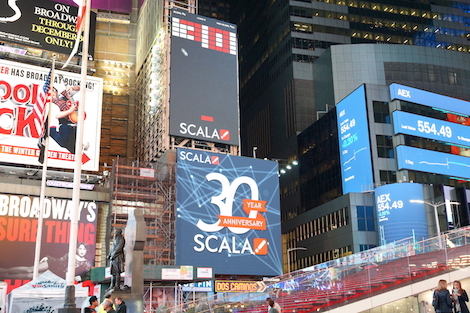 For the occasion, Scala took over two ClearChannel digital billboards in Times Square (shown above), one of which (the top one in the photo above) allowed attendees to play a version of BREAKOUT from the comfort of the Renaissance Hotel bar. Shown above is EMEA Vice President and General Manager, Harry Horn and some of his marketing team. Shown above is Chris Riegel opening the evenings proceedings with a short presentation to the crowd. 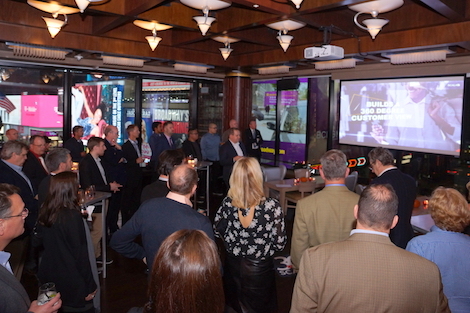 The event was well attended and it was nice to see the two longest serving Scala employees, namely Peter Cherna and Clive Fort and former CEO, current board member and DailyDOOH Lifetime Achievement Award winner Gerard Bucas present. The event took place November 1, 2017 20:00-22:00 at the Renaissance Hotel, overlooking Times Square. This entry was posted on Monday, November 6th, 2017 at 10:00 @458 and is filed under DailyDOOH Update. You can follow any responses to this entry through the RSS 2.0 feed. You can leave a response, or trackback from your own site.